Adorable 2 Bedroom Condo with Water Views, Steps from the Beach! Shorehaven 1 J1 is only steps from the beach, making it a perfect spot for your next North Myrtle Beach vacation. Enjoy the Ocean Drive Difference by starting your vacation immediately upon arrival, as this property comes with fresh bed linens/bath towels, the beds are already made up for you, and the departure maid service are all included in your price. This two bedroom, two bath condo is a close walk to the wide beaches of North Myrtle and a short drive to all the area's fantastic restaurants, phenomenal shopping and world class entertainment, not to mention some of the best championship golf courses anywhere. This spacious beach getaway is absolutely lovely and has televisions and DVD players in both bedrooms as well as the living room. You'll find ceiling fans throughout and you'll enjoy beautiful, serene views of the lake from both bedrooms. Light and airy interiors, coupled with a panorama of the freshwater lake, make this the perfect beach retreat. The fully equipped kitchen is complete with microwave, dishwasher, range and everything you'll need to prepare your meals. Or, you may wish to grill some freshly caught seafood on the gas or charcoal grill. Take your pick because this condo offers both! A washer and dryer are also included in this fantastic beach rental so you'll be able to keep up with those beach towels in the comfort of your own condo. 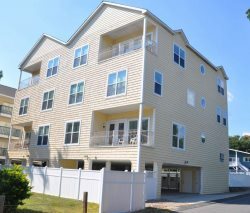 Call now to book your vacation at Shorehaven! Bonuses include free parking, great outdoor amenities, water view, and extra savings through our Endless Fun Club. This condo is a great way to accommodate your family in style while enjoying incredible savings compared to oceanfront rentals.